"Life can be very tough for a stray cat like him, and he could have resorted to desperate means to try and feed himself. He must have been in a lot of discomfort and pain before he was handed in to us." Being homeless on the street and without any visible means of support inevitably leads to persistent bouts of hunger and that in turn forces a cat into taking all sorts of risks that it normally would avoid. Under such trying circumstances, the most readily available avenue of relief open to it is scavenging in bins and skips even though doing so unwittingly places its precious life in mortal jeopardy. That is most likely what happened to a ginger and white tom of undetermined age named Henry who was discovered sometime this spring emaciated and disheveled on the fifteen-acre campus of the all-boys Papplewick School in Ascot, Berkshire. Taken in by Cats Protection's Bracknell and Wokingham Branch in Bracknell, forty-eight kilometers west of central London, he almost immediately became seriously ill. Although shelter personnel were fully cognizant of a bulge around his abdomen that would sometimes appear and then mysteriously disappear, they were nonplussed as what to make of it. The charity's veterinarians at first thought that Henry could be suffering from either a worm infestation or a kidney infection but when neither of those wretched maladies proved to be the case they elected to take a biopsy. It has not been explained why either a less invasive x-ray or an MRI would not have sufficed just as well. To have so severely balled up Henry's stomach and digestive tract, the piece of plastic surely must have been considerably larger when he swallowed it. It additionally never has been explained why he was unable to expel the small amount of plastic that remained in his system but the most plausible explanation is that it had become entangled in his organs and refused to budge. Over time it may have eventually biodegraded into even smaller pieces and then harmlessly exited his body but well before that occurred it just as easily could have claimed his life. Fortunately for him, he was not forced to play Russian roulette with nature in that the surgeons were able to successfully remove the plastic. 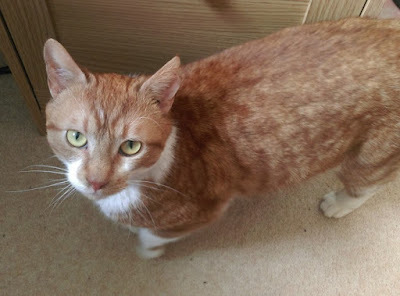 "Since it's been removed he has made a full recovery and the sickness stopped straightaway," is the good news that Pack delivered afterwards to Your Cat. "Henry has made a great recovery, put on weight and is enjoying life." As to why he came to ingest the plastic, Pack is of two minds. "We have no idea why or how he came to eat it, it is something of a mystery," she first told Your Cat. "But he was very thin, and had obviously been a stray for some time, so the most likely scenario is he swallowed it accidentally as he foraged through bins for food." She also believes that he could have swallowed it intentionally. "Some cats are known to have a bit of a compulsion toward eating strange things, for example, wool or plastic," she added as a second thought. While only Henry knows for sure what actually happened, Pack likely is mistaken on both counts because cats do not have the least bit of culinary interest in either plastic or wool. What they do crave, however, is meat and plastic, wool, and other such materials often contain not only residues of it but its smell as well. The same can even be said for cheese and milk. In particular, the plastic foam trays and cellophane in which raw meat is packaged and sold to the public pose a significant health hazard for all cats. Since both the cellophane and plastic foam retain not only blood but the smell of meat, it is not uncommon for them to try and eat both of them and the same logic is applicable to plastic trash bags as well. It therefore is imperative that all such packaging be disposed of properly. As is the case with just about everything else in this world, there is even a negative side associated with the proper disposal of food and beverage containers in that cats, wildlife, and other animals often depend upon the trace amounts of food that they contain for their very survival. Even the poor and the miserly of the big cities often find themselves in the same boat and that, by the way, is how dismembered bodies and discarded newborns sometimes are discovered. The only compassionate solution to that conundrum is to go ahead and properly dispose of unwanted food and their containers but at the same time to also leave out provisions for cats and other animals. That must be done in an astute manner, however. The deprivations and perils that Henry was forced to confront all by himself every single day and night throughout his extended period of sleeping rough have demonstrated writ large once again how vitally important it is that all cats have homes to go to and loving guardians to take care of them. "Life can be very tough for a stray cat like him, and he could have resorted to desperate means to try and feed himself," Pack told Your Cat Magazine. "He must have been in a lot of discomfort and pain before he was handed in to us." Since Henry was found at Papplewick, it is conceivable that he was abandoned there by any one of the two-hundred or so lads who attend classes at the preparatory school. It also is possible that he was deliberately dumped at the world famous Ascot Racecourse across the street and then simply wandered onto campus. Regardless of where he came from or how he became homeless, nobody came forward to reclaim him and as the result he was vaccinated, fitted with a cancer-causing microchip, and then put up for adoption as soon he had recovered from emergency surgery. "He is very friendly and will make a lovely pet," Pack affirmed to Your Cat Magazine. She did, however, add one caveat. "So anyone who adopts Henry will need to make sure he doesn't have access to plastic bags just in case he takes a nibble," she told Your Cat. The problem of cats swallowing inappropriate objects is by no means limited to plastic trash bags. 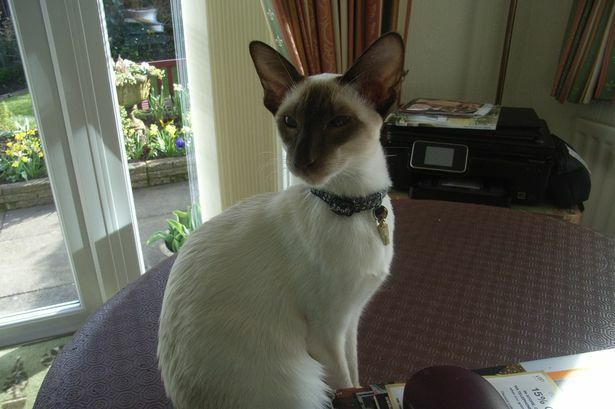 For instance, a white and brown Siamese named Roxy from the Birmingham suburb of Kings Heath accidentally swallowed a long piece of elasticated string in August of last year. Fortunately for her, she had an attentive owner who promptly intervened and saved the day for her. "Roxy likes to play with toys and has always had a habit of chewing on them," Carole West divulged to the Birmingham Mail on August 23rd. 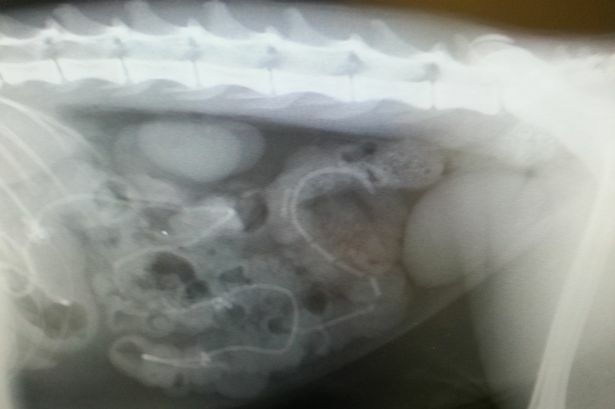 (See "Incredible X-Ray Shows Birmingham Cat Which Swallowed Feet of String from Favorite Toy.") "We were so worried about her when she threw up around a foot of elasticated string, and had no idea how serious the situation was." What she did have, however, was both the savoir-faire and the moola in order to rush Roxy to YourVets' surgery in the village of Wythall in Broomsgrove, Worcestershire, eight kilometers south of Kings Heath, where an x-ray revealed that the string had snarled in her stomach and intestines. It was touch and go on the operating table for a while but in the end Roxy survived. "The operation was extremely complex and required two surgeons to remove all the portions of string," veterinary nurse Jane Gallagher told the Birmingham Mail. "The situation was certainly life-threatening and Roxy would have died without surgical intervention." Although she was pleased that the veterinarians had been able to save Roxy's life, Gallagher added a cautionary note. "Owners must supervise their pets when playing with toys of any kind, even those not designed for chewing," she added to the Birmingham Mail. "We see cases like this quite commonly in puppies, and particular breeds of dog (sic) who love to chew such as bull terriers, Labradors, Dalmatians and spaniels." That is a message that West already has taken to heart. "We're so grateful to YourVets for restoring her to full health and will be keeping a much closer eye on her from now on!" she pledged to the Birmingham Mail. Press reports at the time failed to even broach the subject of YourVets' fee but the services of a pair of surgeons doubtlessly wound up costing West several thousand pounds. Nevertheless, since she can afford to own a cat like Roxy she also likely is able to pay for her emergency veterinary care as well. Since cats love just about any game of chase, it is not surprising that they like to play with strings. It nonetheless is far from clear exactly what is that prompts them to eat them. It could be that they are attracted to certain types of strings that have peculiar smells and tastes. It also is conceivable that owners who have previously handled meats and other foods may have unwittingly transferred those smells and residues to the strings. The situation is made all the more perplexing given that a cat's teeth are designed for ripping apart large sections of meat. They accordingly have difficulties even biting into a biscuit, let alone getting down a lengthy piece of string. It accordingly might be a good idea to allow cats to chase and play with only thick strings, such as ropes, that they are unable to ingest. It would be better still to follow Gallagher's advice and not allow them to play unsupervised with any type of string. Just as Roxy had West in her corner, Harry had Cats Protection in his. The same cannot be said for a nameless Philadelphia cat who was rushed to PennVet in December of 2013 after having swallowed a piece of ribbon from a Christmas present. The cutthroat practices of the veterinary medical profession are nowhere more vividly demonstrated than in PennVet's cold-blooded murder of this defenseless cat. Considering the University of Pennsylvania's nearly ten-billion-dollar endowment, the veterinarians easily could have saved its life without feeling so much as a financial twinge but they were too cheap and uncaring to do even that. The lesson to be learned from this cat's needless death is that an owner needs to keep on hand an emergency fund of at least $5,000 that can be put toward saving the life of a feline companion who unexpectedly becomes either ill or injured. Otherwise, the cat is doomed. The next task is to secure the services of a competent and trustworthy veterinarian and although YourVets did a simply superlative job in treating Roxy, it generally speaking is best to steer clear of chain surgeries. By contrast, since small-time practitioners must by necessity do their own work that normally precludes them from fobbing off the care of cats onto trainees, temporary employees, part-timers, and other hourly wage earners. As both Henry and Roxy discovered to their detriment, disaster can strike in the most unexpected ways. Even though plastic trash bags, strings, and ribbons may be mundane and ubiquitous, they also can be deadly for cats. Above all, no one ever wants to be forced to go through the cruel fate that was foisted upon the Philadelphia owner. It is a sad commentary upon modern-day life but morality and compassion no longer count for much of anything in this world. As a result, all that often stands between a live cat and a happy owner on the one hand and a dead one and a distraught caretaker on the other hand is a bushel basket brimming over with simoleons. Photos: Your Cat (Henry), the Birmingham Mail (Roxy), and the Mirror of London (Roxy's x-ray).